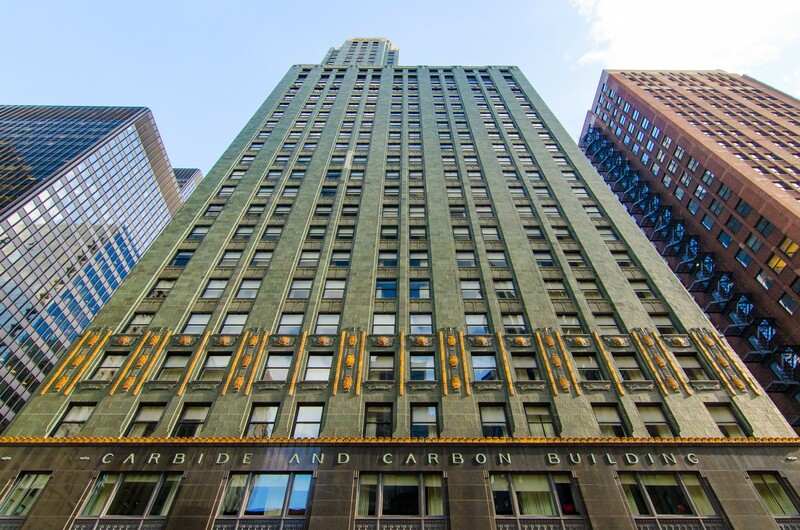 Luxurious, exuberant and dramatic, the Carbide and Carbon Building is a metaphor for the sumptuous décor of 1920s America. 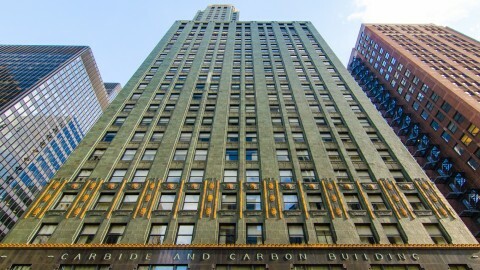 The Carbide and Carbon Company, which developed the first dry cell battery, needed a regional headquarters to house its rapidly expanding business. Company executives wanted the building to make a statement, to communicate the firm's success and to attract clients. 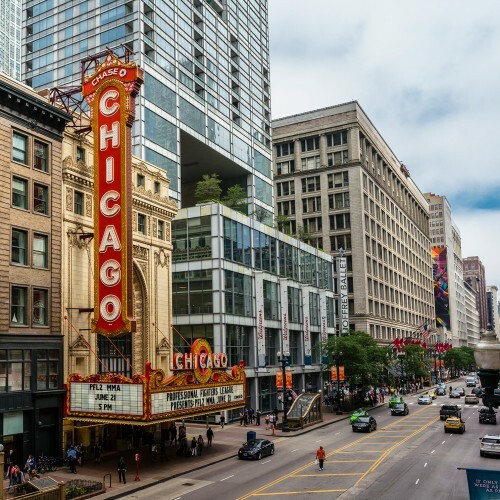 They commissioned the Burnham Brothers (sons of the deceased Daniel Burnham), who completed the structure in 1929. 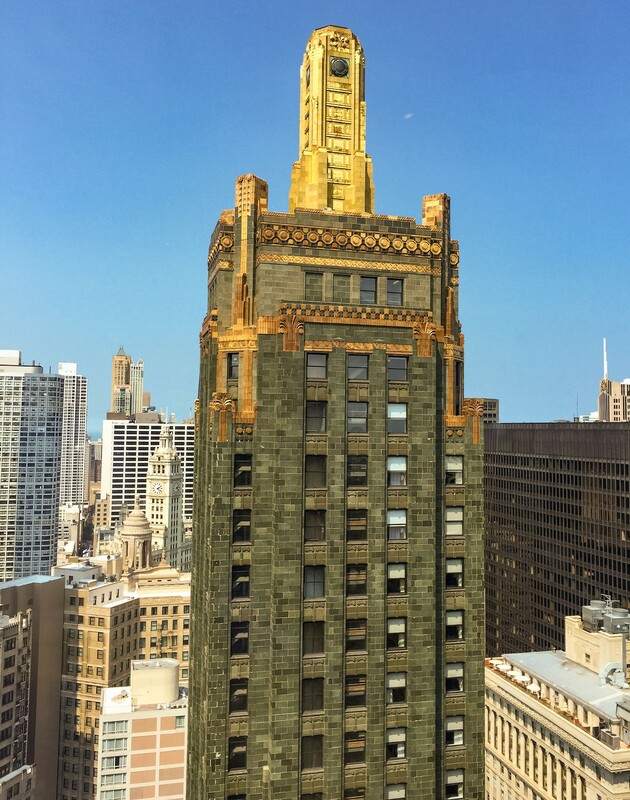 To recognize the building’s contribution to Chicago’s rich architectural history, the city keeps the gold spire permanently lit. Only a handful of buildings receive this distinction. Because of the zoning laws at the time of the building’s construction, its tower is setback to allow more sunlight to reach street level. 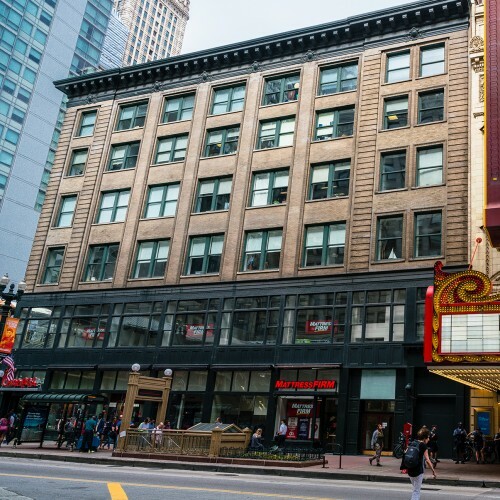 Interlocking C’s are still present on the building’s façade as a remembrance of the building’s original owners. Imitation gold leaf was originally considered for the building’s top, but ultimately rejected in favor of the real thing. The stylized leaf ornamentation on the exterior is a reference to the prehistoric origins of subterranean carbon deposits from decaying ancient plants. The building’s brilliant blue cyanotype blueprints were in storage for decades, only to be revealed in 2008 for an exhibition at ArchiTech gallery in Chicago. 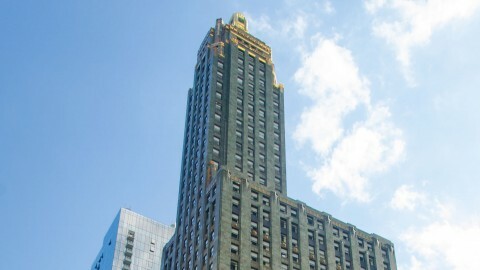 A dazzling building on Chicago’s skyline, the Carbide and Carbon Building epitomizes the lavish excitement of Art Deco. 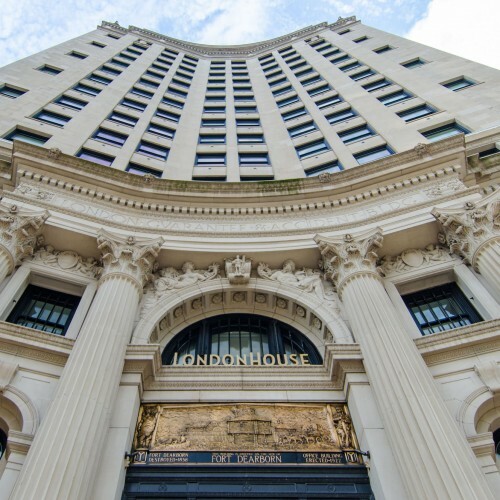 The facade is composed of luxurious polished black granite, green and gold terra cotta and gold leaf with bronze trim. 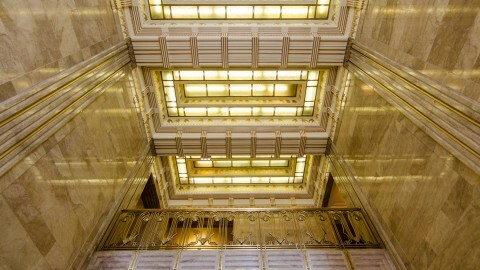 The building’s interior is known for its extravagant lobby, originally used to display the company’s products. 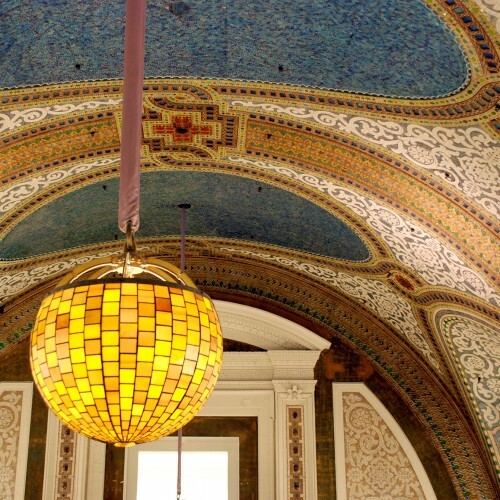 Frosted glass fixtures and Belgian marble greet visitors at its Michigan Avenue entrance. 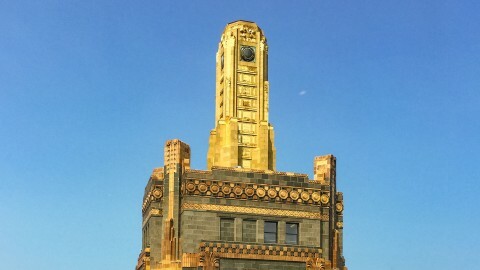 The building’s cap is ornamented with genuine 24 karat gold, though it is only one five-thousandths of an inch thick. Bronze trim extends from the tip of the spire to the ground level. 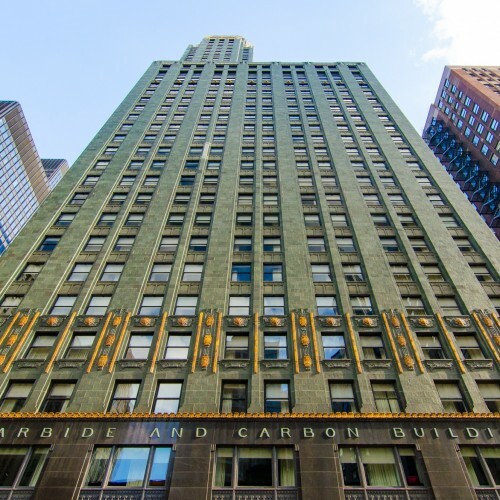 Its warm and sensuous materials make the Carbide and Carbon building unique among Chicago’s towering skyscrapers. 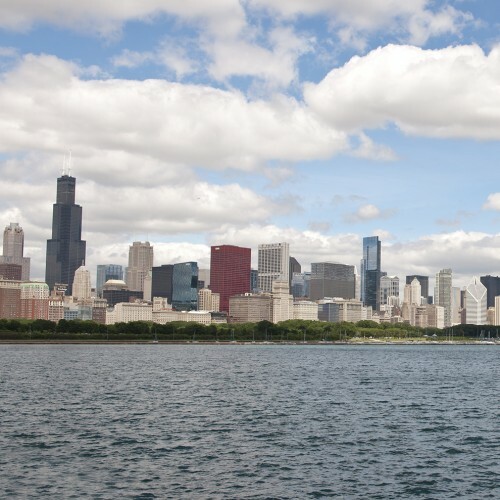 Every tour I give where this Chicago landmark can be seen, a tour taker will ask about it. The Carbide and Carbon delights and awes. 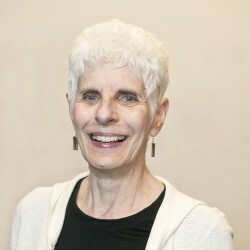 All good things must come to an end, as they say. 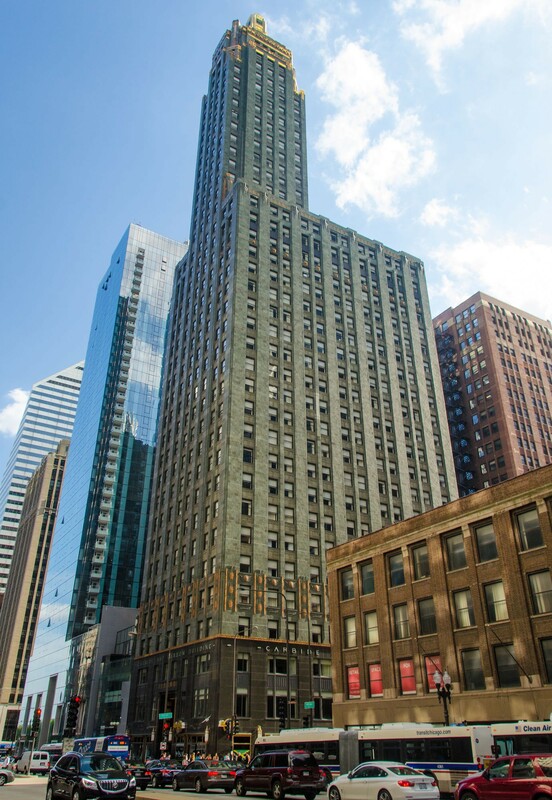 With the market crash of 1929, a planned sister building to the Carbide and Carbon Building was cancelled, making it the sole fully-colored skyscraper in the world at the time. 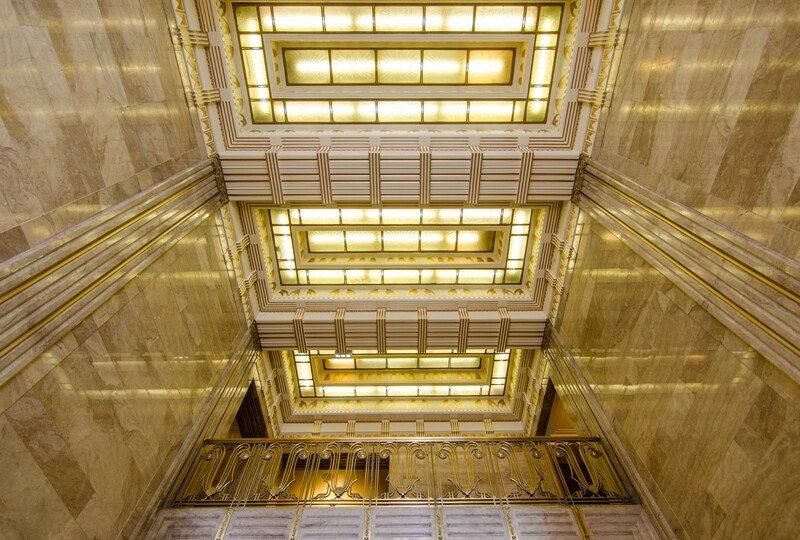 The building was landmarked in 1994 and in 2004 it underwent a $106 million restoration. 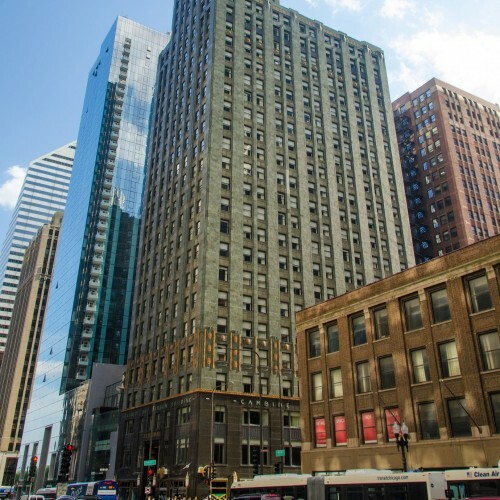 After being sold to a realty company, the building became the new home for Chicago’s Hard Rock Hotel. It still stands out as one of the most unique structures on the city’s skyline.